MORGANTOWN, W.Va. – Investigators at the West Virginia University Rockefeller Neuroscience Institute performed the first procedure in the world of a phase II trial using focused ultrasound to treat a patient with early stage Alzheimer’s. The procedure took place yesterday, and the blood brain barrier was opened successfully; the patient was sent home earlier today. Led by neurosurgeon Ali Rezai, M.D., the WVU team tested this innovative treatment in collaboration with INSIGHTEC, an Israeli medical technology company. Earlier this year, INSIGHTEC was approved by the U.S. Food and Drug Administration to begin a phase II clinical trial of the procedure, and selected the WVU Rockefeller Neuroscience Institute as the first site in the United States for the trial. The new treatment, which involves incisionless surgery and no pharmaceuticals, represents a potential important next step in the treatment of Alzheimer’s. The trial will evaluate the potential benefits of using focused ultrasound treatment to disrupt the blood-brain barrier in the regions of the brain affected by Alzheimer’s, such as the hippocampus. The team from the WVU Rockefeller Neurosciences Institute, led by Ali Rezai, M.D. 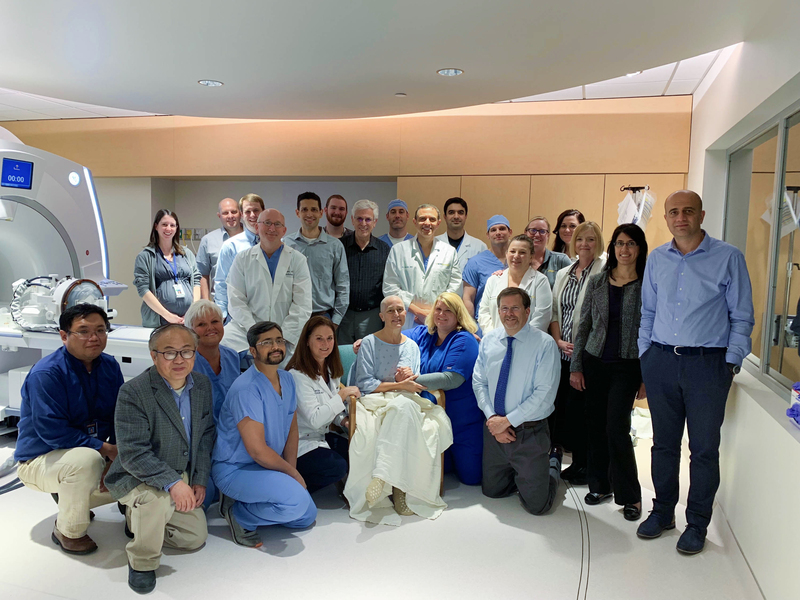 (standing, ninth from left), poses for a picture with Judi (seated, front row), the first patient in the world to undergo focused ultrasound as part of the phase II clinical trial to treat Alzheimer's disease. Last summer, researchers at Sunnybrook Health Sciences Centre in Toronto reported the results of a phase I safety trial showing that they could reversibly open the blood-brain barrier in Alzheimer’s patients. The current phase II trial is the next step to test focused ultrasound’s effectiveness as a treatment. This study will evaluate whether focused ultrasound reduces the debilitating plaques and cognitive decline that are the hallmarks of the disease. The blood-brain barrier separates the bloodstream from the brain tissue itself, and it limits many potentially effective medicines and the immune system from reaching diseased areas of the brain. During this phase II trial, doctors inject microscopic bubbles into the patient’s bloodstream. When the bubbles are exposed to focused ultrasound, they temporarily cause the blood brain barrier to open at the specific part of the brain targeted. In this case, the West Virginia team targeted the hippocampus and the memory and cognitive centers of the brain which are impacted by plaques found in patients with Alzheimer’s. The first patient in the WVU Rockefeller Neuroscience Institute trial is a 61-year-old nurse with early-stage Alzheimer’s who had to stop working due to disease-induced short-term memory loss. In this ultrasound procedure, which lasted three hours, she underwent MRI scans and focused ultrasound of the hippocampus. The results demonstrate that the blood-brain barrier was safely and successfully opened. After the procedure, Judi, whose full name is not being released, was in good spirits and went home. The potential benefits of this first and subsequent treatments will take several years to fully evaluate. “I am hopeful that focused ultrasound opening of the blood-brain barrier will prove to be a valuable treatment option for Judi and other patients with early Alzheimer’s who are confronting the enormous challenges associated with the disease on a daily basis,” said Dr. Rezai. There is currently no known treatment that can stop or reverse the progress of Alzheimer’s, which affects 5.4 million Americans. Additional patients are expected to participate in the study at WVU. To see if you or a family member might be eligible, please call 304-293-5150 or email WVURNI@hsc.wvu.edu. The West Virginia University Rockefeller Neuroscience Institute is a global leader in the discovery, development, and delivery of world-class research in human performance and brain health. It includes the clinical, research, and academic missions of the WVU Departments of Neurosurgery, Neurology, and Behavioral Medicine and Psychiatry, as well as several other academic departments across the entire university. The Institute will spearhead efforts to develop innovative solutions for West Virginians and those across the world with neurological and psychiatric conditions ranging from Alzheimer’s to Parkinson’s; autism to stroke; and paralysis to chronic pain, addiction, and traumatic brain injury.